Persistence … the difference between Success and Failure! After studying tirelessly the art of success I can safely say, without any doubt, that one thing that every successful person must have … is persistence. This is so important in whether you achieve your dreams or not, I can’t stress highly enough how critical this is on your pathway to success. So many times people work extremely hard and get so close to their end goal that they can almost touch it but then things slow down or halt altogether and they struggle to get themselves over the finish line, and instead of keeping on at the same rate they succumb to frustration and give up. They may have been just one small change away from reaching their dream but their frustration was more powerful than their persistence. Here’s a prime example of this theory, a friend of mine had a couple of stones of weight to lose and had a vision of what he had to do to achieve that. This guy worked extremely hard every day going to the gym, eating well, going long walks and cutting out all the junk from his diet. I’m telling you this guy was an inspiration, he worked so hard we all couldn’t help but be impressed. The initial results were fantastic, he lost the first stone with ease but as he continued his fight to lose the second stone the weight loss began to slow down and all the work he was putting in failed to bring the same results. He had hit a plateau. To an average person this plateau can appear to be a permanent, unbeatable road block that they can never see themselves getting past. They resign themselves to the fact that they will never reach their end goal and give up. Most of the time once they have given up they return to their old routines of bad eating and no exercise, and over time they return to their original state. But to a successful person a plateau is nothing but a temporary set-back or challenge along the road. They know it is not permanent and that if they stick with it they will find a way around it. They know that all they require is the right perception and persistence. Sometimes they may have to adjust their plan or route around the road block but either way they know they will get to their destination in the end either way. With my friend, he may have been on course for losing the weight he desired if he had only made just one tiny adjustment more, like smaller portion sizes or swapping one of the things he was eating. It can be that simple. Don’t give up on your goal because Plan A didn’t bring you the end result. Re-write the plan, find plan B, C, D or E if you have to. Find one that DOES work and continue along your quest. Giving up is a choice, a poor one at that but one that many make. Every challenge you face is made up of many different breaking points. Many points that could stop you if you let them. When you stumble along a road block like one of these think of this analogy – Imagine you are trying to crack a 10 digit code that opens a safe. You may already have the first 9 digits and unbeknown to you the safe is almost open. If you stop because you can’t figure out number 10 you will be stopping right before the safe opens and you receive the riches inside. If you are persistent and never give up you will undoubtedly eventually find that final digit to unlock the riches. It is easy to give up … but before you do, remember why you started and consider this … maybe you are only one tiny change away from unlocking everything you ever dreamed of. Is that not enough to keep on going? Thank you – I needed to hear this message today. This is so beautiful! Just exactly what I would want to hear, read and write to inspire! If there is a main difference between success and failure, persistence has to be number one on the list. There’s a positive mindset, faith, taking action, etc. 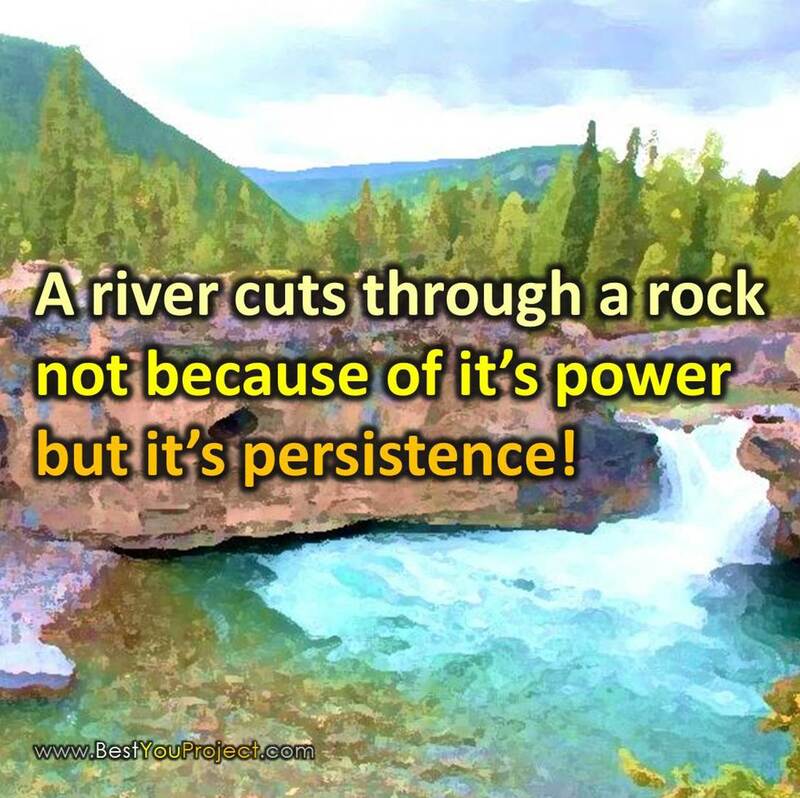 However, persistence is all of them wrapped up in one! Great sound advice. Thank you. This is a great post and I love your analogies! Thanks for this important reminder.